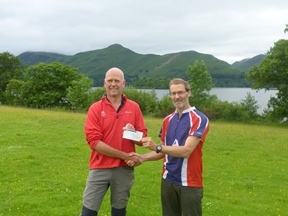 West Cumberland Orienteering Club (WCOC) has donated an amazing £250 to Fix the Fells following their annual fundraising events! The money was raised through running several local orienteering events from which all the proceeds go to charity. West Cumberland Orienteering Club actively introduces people young and old to the outdoors through the fantastic sport of orienteering, with members who range from beginners to elites who have represented England and Great Britain. £250 pays for three bags of rock to be moved by helicopter for example, which enables our Ranger teams and volunteers to work on the paths each year.